A unique, informative, very readable and practical book, "Designing Sound" presents advanced sound design methods for tomorrows video games, interactive applications and computer animations. Keywords: Sound effects, sound design, synthesis, interactive audio, Pure Data, acoustics, digital signal processing, psychoacoustics, physical modelling, procedural audio, analysis, game audio, audio programming, film sound, animation, TV, radio, multi-media, theatre. Audience: Sound producers, game audio developers, sound technology students, film sound designers, interactive application programmers. Physical sound, vibration and acoustics. Introduction to the Pure Data audio programming language. Over 30 step by step exercises to create common sounds. References to textbooks, papers and online resources. Code and sound examples available to download. What is procedural sound design and Pure Data? Pure Data is to ordinary sound editors what 3D Max is to Photoshop. Instead of manipulating existing recordings you can create sounds from scratch. Sound objects can run in real-time in games and interactive applications, influenced by events as they happen. You can also create customised audio applications and workflows that are much more powerful than traditional plugin chains for traditional off-line sound design needs. This book shows you how. With over 30 chapters of practical exercises demonstrating original sound design algorithms the reader is taken from novice level to using the most advanced techniques available to modern practitioners. Pure Data is a powerful, freely available tool that integrates into your existing DAW and works on any platform like Mac, Windows PC or Linux. It is also runs on mobile platforms such as the iPhone and games consoles. "Designing Sound" explains the procedural approach to next generation real-time audio, for games, interactive applications and computer animation. Weighing in at 650 pages this extensive work is possibly the best value textbook published on the subject. 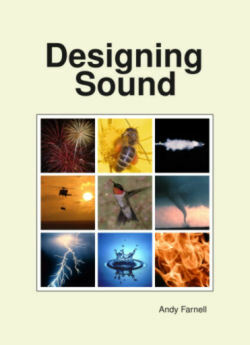 "Designing Sound" is essential to all sound technology students and practicing sound designers. Beginning with sound as energy it introduces the concepts of power, work, mass, and material properties. With the minimum of mathematics the theory of waves, simple harmonic motion, vibration modes and resonance are dealt with before progressing to a discussion of acoustics and sound propagation. Subsequent chapters deal with digital representations, psychoacoustics, listening schemas, metaphor and meaning, before building into what can only be described as a ground-breaking approach in the chapter on "Techniques". Here sound design is treated formally as an engineering task along with a complete methodology for the analysis, modelling and synthesis of any sound from first principles. Kees van den Doel. Scientific Computing Laboratory, University of British Columbia. Philippe Aubert Gauthier. Ing.jr Mech Eng. CIRMMT. McGill University, CA. Andrew Bucksbarg. Department of Telecommunications, Indiana University. Karen Collins. CCAT. Univ. of Waterloo.